The Irrepressible Black Cat Duncan! Hi Hi Hi!!!! My name's Duncan! I'm a seventeen pound sleek black cat but don't let that fool you - I still want to play just like I did when I was a tiny kitten. And how did I get so big, you may ask? Well, what mom tells the vet is it was all the diet food she's been feeding me. hahahaha! Actually, we get premium cat food, the Science Diet stuff, but we do get the diet cat food because of Callie. I used to be the baby cat of thuh family but that changed about a year ago when Jackson, our young orange cat with a bob tail, moved in. I was born in July 1998 in thuh Out and my mama cat went to the Rainbow Bridge shortly after that. A nice lady took care of me and my littermates until we were old enough to find our own OneTrooHomes. My mom came and brought me home one day in September. She was kinda sad because she still missed Dexter, my black cat broffur I never got to meet cuz he went to thuh Rainbow Bridge before I joined the family. But, still, she seemed furry happy to have me join the family and soon, she said, I had a place in her heart evfurry bit as big as Dexter's. After I moved in, I met thuh family and Maxwell adopted me and became my daddy cat! He was wonderful! He played with me and napped with me and groomed me (and shared his food, too - whether he wanted to or not! ssslurrpp!) Now, he says I play too rough for him, but I can still talk him into a good cat wrestling match now and again. Life is good. I think I'll stay. I used to try to convince Callie and Chloe to play, too, but they're wimps. Well, maybe Callie isn't, but all she wants to do is hiss and snarl at any cat who happens to invade her space. And everything in about a 20 foot diameter is "her space". ssigh. So, now, Mom says I'm getting back some of my own. Jackson keeps trying to play with me and I don't WANT him to! He's a little brat! One of mine favorite activities is to traipse across thuh tightrope (AKA thuh dining room drapery rod). 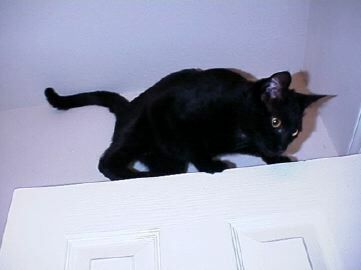 Only problem is...every time I'm just about to step from thuh top of thuh cabinet to thuh tightrope, mom calls mine name and gets me to come talk to her. But when I get there, she furgets what she wanted. I think she's getting old and furgetful. That's gotta be it. I don't have any pikchurs of this yet (mine balance act, not mom's furgetfulness), but if I ever manage to sneak past mom's attention to thuh top o' thuh drapes, I'll try to be sure we get a pikchur to share. Purrsonally, I think she should get me mine furry own cat furniture and toys to play with. Another funfun thing to do is to take mine softfrendz (stuffed animal toys, catnip bags, fur mousies, blistex tubes, pipecleaner toys, yoo name it) swimming inna toilet. This is especially fun in thuh middle of thuh night. I like to toss em in and fish em out and toss em in and fish em out, over and over again. Of course, sometimes I get distracted in the middle of thuh game.....so they have to be rescued by mom so they won't drown. er...we won't mention how many of mine frendz have been....um...lost.